#BBWEDCHALLENGE : WE’RE KICKING OFF AUGUST WITH AN INSTAGRAM CHALLENGE! I mean wowzers, it’s August already?! How did that happen?! We thought we would kick off the month with a super fun Instagram challenge because we absolutely love the community that we have here at Bespoke Bride and love love love seeing our reader’s snaps so we CAN’T WAIT to get this challenge started!! Never been part of an an Instagram challenge? No worries! It’s super easy! All you need to do is save the below image (just so you can check back), and — if you like — upload it to your Instagram account with the hashtag #BBWEDCHALLENGE . Then, you just upload photos that match the challenge on the day using the same hashtag! We would love it if you tagged us in the photos too! We’re @BESPOKEBRIDE on Instagram! 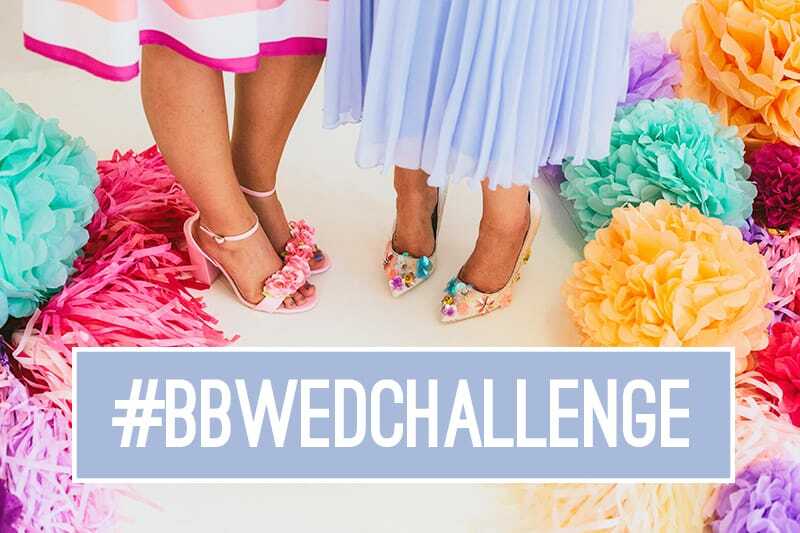 The best part about this challenge is that you can browse the #BBWEDCHALLENGE regularly and see your fellow BB readers joining in and connect with them! You never know what wedding inspiration you’ll discover, what suppliers you may find or who you’ll connect with! We want to start the challenge by seeing yours and your partners beautiful smiley happy faces! Share a cute selfie of the two of you! Flowers are the bomb! Show us your favourite flower or the flowers you’ve chosen for your W-Day! Are you having a specific theme to your wedding? Maybe you’re going boho, or festival, rustic or Mexican! Whatever the style, share with us a photo of some super styling you love! Don’t forget to tag where the photo was from! We want to see your favourite shade of lipstick! It’s always so handy finding new lipstick colours am I right?! You may find a new favourite shade from another bride to be! What shoes are you going to wear on your wedding day? Do you have them already? Or if your’e dreaming of a certain special pair then we want to see those too! Don’t forget to tag the designers of the shoes as well so other brides or grooms to be can grab a pair if they love them! Do you and your other half share a joint passion or hobby? Share a photo of you guys doing something you enjoy! Show us those engagement rings! We love how many different styles, sizes, shapes and colours there are! It’s Monday morning so let’s share what starts the day off! Are you a tea obsessive like me? Or do you kick off the day with a smoothie like Em? Or perhaps you’re a coffee lover! Got a favourite wedding magazine that’s your absolutely bible right now? Or a blog you’re totally in love with?! Share something of theirs and tag and tell them why you love them! Share a throwback of you and your other half! Maybe even a favourite memory of the two of you! We all need our gal pals and nothing is as fun as a girls night!! We want to see you and your bridesmaids or gal pals having a fab time! Know how you’re going to have your hair styled on the big day? Or have you seen a style that you think would be perfect? Did you have a bridal shower? Or seen one online that you fell in love with? Do you have the dress? You may not want to share the whole thing but how about a sneaky peek?! Maybe a super close up! Or share with us a dress from a designer that you love love love! You only have to take one peek at our Instagram or our blog to discover that we love bright, bold and beautiful colours! Share a colourful snap of anything you like and let’s fill the feed with rainbows! Are you going to be making anything for your wedding? Seen a tutorial you loved? Or have you already made something? You know how obsessed we are with DIYs!! Seen some invites or save the dates you love? Or maybe you have them already? Show us a sneaky peek and let us know where they were from! Do you have a signature perfume that you always wear or are you going to be wearing something extra special on your W-Day? Date nights are super fun and super important! Share with us a date that you loved with your other half! Let’s talk about cake. In fact we could even eat some! Grab yourself a slice and take a snap or share a piccy of your dream wedding cake! Has somebody been super helpful throughout your wedding planning or just generally in your life? Share a little post to thank them and show how grateful you are! Show us what accessories you’re going to be rocking with your wedding outfit or some accessories that would be perfect! Share with us a little something more about you! What makes you happy? Seen some beaut nails that you would love for your wedding? Don’t forget to tag where you found the pic! It’s no secret that we love confetti! Bonus points if you’re throwing it up in the air or it’s all over your hair! Hey it’s a Saturday, are you indulging in a few cocktails or two? If you’ve had your makeup trial or seen some looks you love then we want to see! We can’t deny it, we love glitter! Let’s add a little sparkle to the feed! Share with us a photo of your dream honeymoon! It doesn’t matter if it’s totally out of your budget, we can all dream and who doesn’t love seeing beautiful exotic places? !